Whether your child has been diagnosed with an autism spectrum disorder or simply engages in problem behavior, it can lead to a stressful and strained home environment. What do I do when he/she wants something that I am not willing to give him/her at this time and he/she begins head banging, screaming or hitting to get it? What do I do when he/she wants something and I am willing to give it to him/her but not for disruptive behavior? What do I do when he/she does not follow a request or instruction and screams, head bangs or hits? What do I do when he/she wants something that I am not willing to give him/her at this time and he/she is head banging, screaming or hitting to get it? 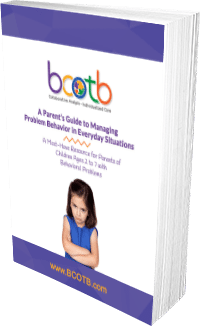 Simply complete the form on the right and you’ll recieve a FREE copy of the Parents’ Guide to Managing Problem Behavior.